This step is optional if you are not promoting through a landing page but instead are direct linking. Otherwise if you are promoting through a landing page and have completed Step 4, you will need to complete this step. If you chose the Simple LP option, you'll see a screenshot similar to the one below. 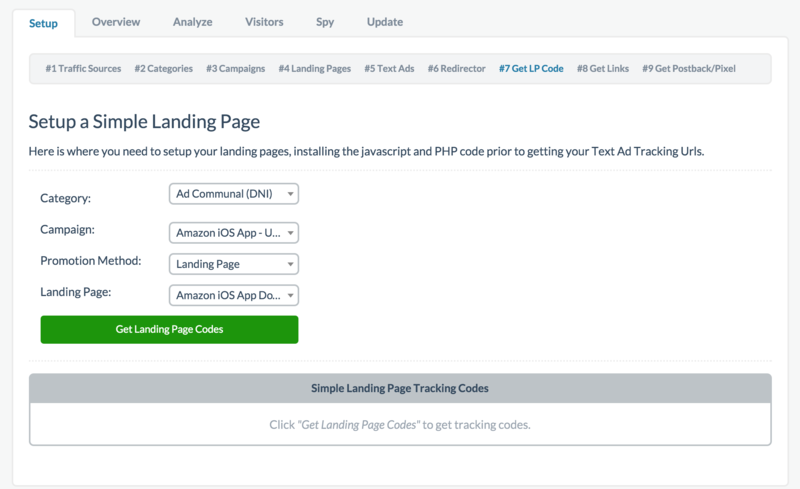 Enter all your information in the dropdowns and click Get Landing Page Codes. Next, you're given a few options for outbound code. 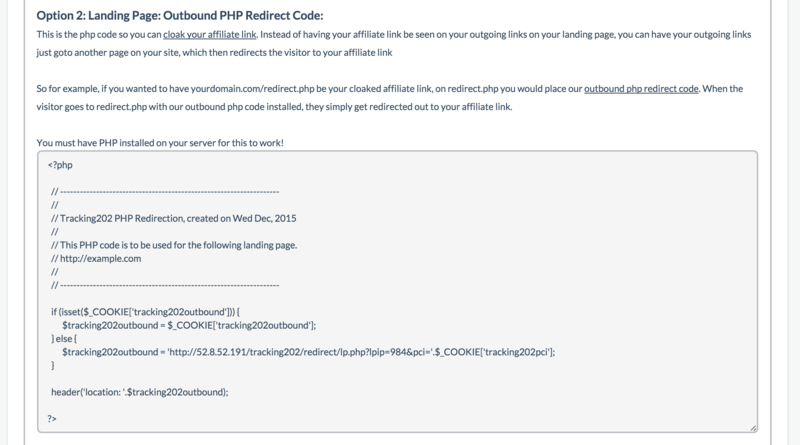 These are code you must use to redirect the visitor from your landing page to the offer. You must use one of the provided methods. The easiest is usually option one where you can replace the outgoing URL with the specific PHP link provided as shown below. You can copy the code and replace your link URL with it. The alternative solution if you don't want such an ugly URL as an outbound link to the offer, you can copy the next section of code, save it in a .php file such as offer.php, and use that as the outbound link. Copy and paste the code exactly into a new .php file. Upload the file to your website and use it as the outbound link. This option is likely the more popular option. Finally if you need it to redirect out because you need to load other scripts such as retargeting or conversion pixels first, you can use the last option but in most instances, you won't likely need to use this last option. You can choose rotator option if you setup a specific rotator rule in Step 6 previously and wish to use it here. 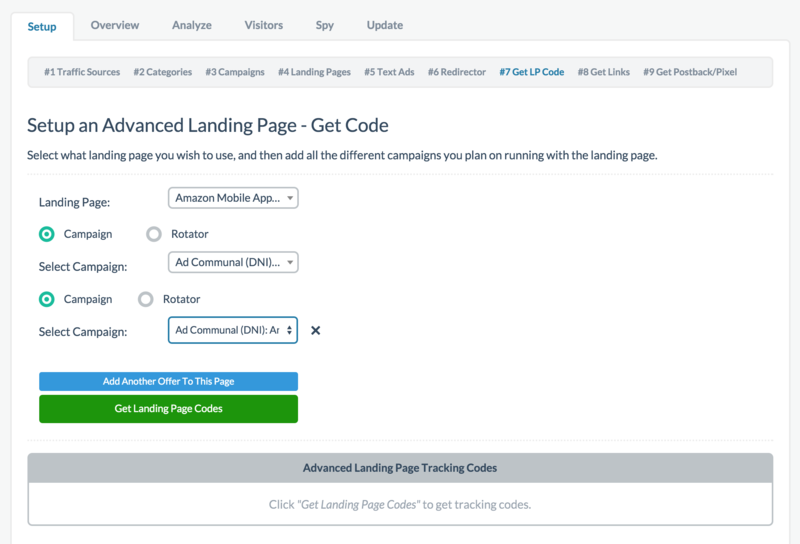 The inbound and outbound code usage are exactly the same as the one for Simple LP. The only difference is you have more outbound codes for each offer you are promoting on your Advanced LP. Please see above section on how to implement inbound and outbound code.